In this article you’ll discover five lesser known Facebook Page features for marketers. 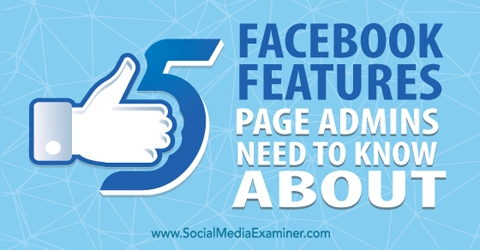 Discover five Facebook features page admins need to know about. 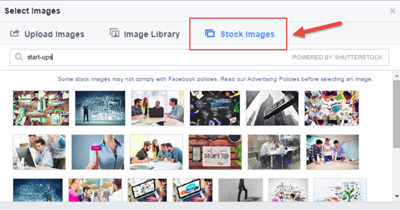 When creating a Facebook ad, you can choose from a searchable database of thousands of free stock images from within the Facebook image library. This takes an extra step out of the ad creation process. You can create Facebook ads quickly by choosing photos from the image library. This image library is powered by Shutterstock, but there’s one important caveat: Not all of the images meet Facebook’s advertising guidelines. For this reason, it’s important to familiarize yourself with the guidelines and choose your images carefully. You don’t want your ads getting rejected over some minor technicality such as the 20% text rule on ad images. The ad relevance score is basically Facebook’s answer to Google’s quality score for AdWords. The relevance score guides how often your Facebook ad will be displayed and how much you’ll pay for each ad engagement. Facebook considers a lot of different factors when calculating your relevance score, including positive and negative feedback via video views, clicks, comments, likes and other ad interactions. If people report your ad or tell Facebook they don’t want to see it anymore, those actions count against you. This score measures how relevant your ad is to your target audience. Keeping an eye on your ad relevance score can help you determine if your ad needs work. Oddly enough, this setting is unchecked by default. To enable ad relevance scoring, open the ad or ad set in your Ads Manager and navigate to Customize Columns. 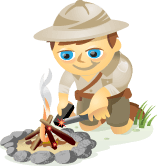 From the list of available columns, find and select the Relevance Score check box. Enabling this option adds a Relevance Score column to your ads reports so you can keep an eye on this metric. A great way to grow your audience is to invite the people in your email address book to like your Facebook business page. To do that, go to your Facebook business page, click on the ellipsis (…) button (next to the Share button on your cover image) and then select Invite Email Contacts from the drop-down menu. 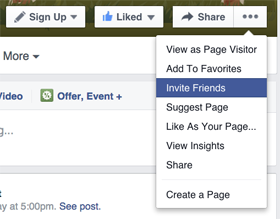 To build your audience for your Facebook page, invite your email contacts to like your page. Next, you see a pop-up box that lists all of the different integration options you can use to import your contacts. Identify the contact list you want to import and click the Invite Contacts link to the right. 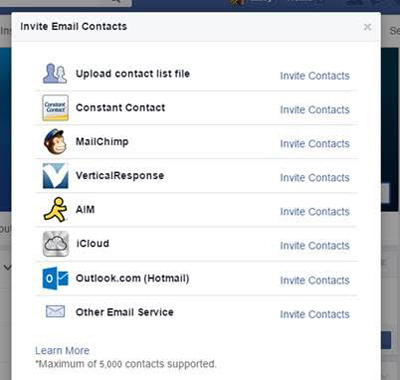 Upload your contact list so you can invite your email contacts to like your Facebook page. After you upload your list, a dialog box appears where you can select which contacts to invite. You have the option to select individual contacts or the group as a whole. After you select your contacts, click Preview Invitation. On the next page, review the invitation, select the check box that you’re authorized to send invitations and click Send. There are a couple of points to keep in mind when sending invitations. You can upload up to 5,000 contacts per day, so if you have large customer or subscriber lists, you’ll have to send invitations in batches. Remember, your page may already be suggested to your contacts who use Facebook, so you can decide whether to email them as well. If you’re already showing up in their recommended pages, it’s just free advertising for you. The ability to schedule Facebook posts is pretty handy, especially if you’re using promoted posts. 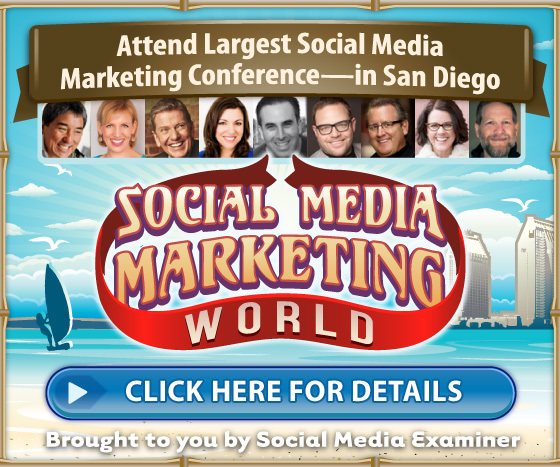 The good news is that you don’t need Hootsuite or Buffer to do it. 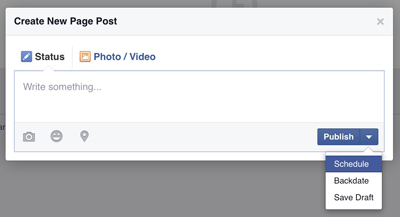 You can schedule future posts right in Facebook. You can even backdate posts so that they appear earlier in your timeline. To access this feature, go the Publishing Tools tab, select Scheduled Posts and click the Create button. From the Scheduled Posts section of the Publishing Tools tab on your Facebook Page, click the Create button to start your scheduled post. Compose your post and then select Schedule from the Publish drop-down menu. From the Publish drop-down menu, select Schedule to schedule or backdate your post. Select the date and time to schedule your post. When you’re finished, click Schedule. Scheduling posts can be especially useful for larger teams where you have different people creating and uploading Facebook content and targeting and launching your social PPC campaigns. At the very bottom of your Facebook Insights page, you’ll find a Pages to Watch area where you can track other pages, such as your partners, competitors and friends. You can see metrics for the likes, posts and engagement on these pages. For example, the Pages to Watch metrics below reveal that HubSpot page likes are currently at 813,200, up 40.6% over the previous week. Also, there were five posts to the page, engaging 158 people. In the Pages to Watch section of Facebook Insights, you can track metrics for the Facebook pages that belong to your industry competitors. 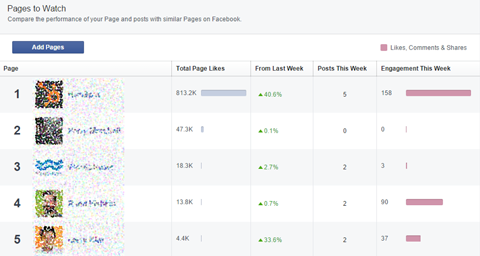 Looking at these metrics is an easy way to track your competitors’ fan growth and look at their engagement numbers. This information can also give you a sense of how many times to post per week. In a nutshell, you can see how your social media marketing efforts stack up against others using real benchmarks (their actual performance). Facebook is constantly being redesigned and refreshed, so it can be hard to keep up with all of the options available to you. The five hidden Facebook features covered in this article are somewhat buried in the Ads Manager and Publishing Tools, so you probably wouldn’t just stumble upon them. But they can be valuable tools for your Facebook marketing. What do you think? Have you used any of these hidden features? Do you have some favorite but less-known Facebook features or tricks? Please share yours in the comments below. 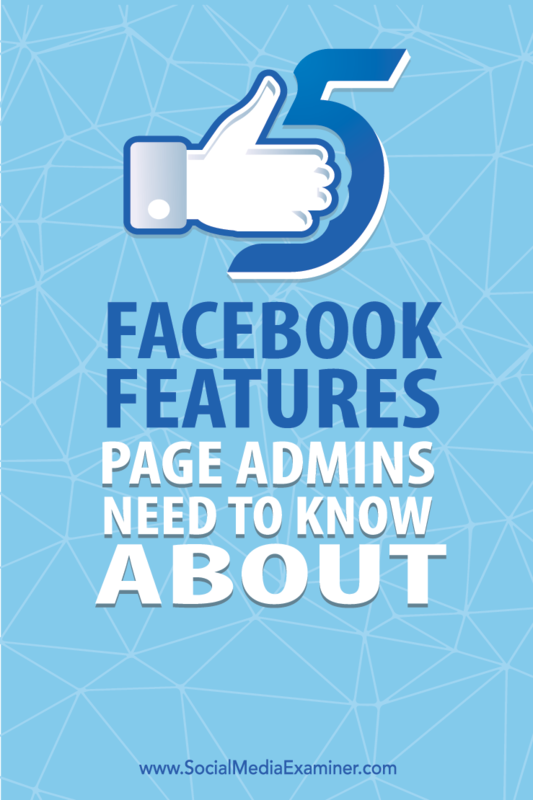 Tips for using five Facebook features page admins need to know about.